This topic contains 0 replies, has 1 voice, and was last updated by Michael Horne 1 year, 8 months ago. 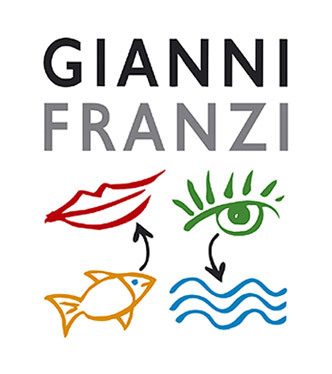 If you’ve been to the Cinque Terre and visited Vernazza, you may have run across a Trattoria on the breakwater called Gianni Franzi (they also run a patchwork of fine rooms as a hotel). 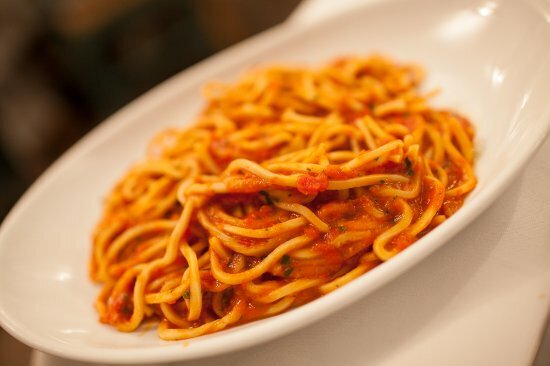 There are several good restaurants in Vernazza along the breakwater, including Gambero Rosso, Taverna del Capitano, and Pizzeria Vulnetia, but when it comes to one local Ligurian dish, there is nobody better than Gianni Franzi: Spaghetti alla Scarpara. The attraction of the Scarpara sauce defies explanation, as it’s a simple tomato and red pepper pasta sauce loaded with oregano, tossed simply with thin spaghetti (almost spaghettini in Italy) and served with grated Parmigiano Reggiano on the side. Once you’ve tasted it, you’re a fan for life. The savory flavors of fresh Italian tomatoes, peppers, onions, capers and a fistful of fresh oregano scream Liguria. Pair it up with the local wine and you’re in heaven. If any dish could turn me into a devoted vegetarian, Spaghettia alla Scarpara would do it. Let’s make Spaghetti alla Scarpara. I have asked Trattoria Gianni for the recipe, and they politely replied “it is made with just tomatoes and oregano.” Yeah, right. Searching online has yielded all kinds of strange concoctions that can’t be what’s served in the Cinque Terre, so I’ve made my best attempt at replicating the recipe here — written down for friends & family. The secret for a fabulous Scarpara sauce is to use fresh ingredients. I recommend you use fresh tomatoes, fresh roasted peppers, and fresh oregano. If you can’t find them fresh or don’t want to take the time, you can use canned alternatives — but it’s just not the same. Fresh oregano is best, but dried is still pretty good. For the peppers, I recommend you find and roast red Italian Corno di Toro (translates as “horn of the bull”) peppers, and be sure to remove their skins and seeds. You could use red bell pepper, but only if you have no other option. Alternatively, you can buy canned or bottled Piquillo peppers that are already roasted and peeled. You can use fresh spaghetti or spaghettini pasta for this dish, but I find that dried pasta works better with the sauce. Remember to cook the pasta al dente. Servings: Makes enough sauce for 4 servings. Wine to pair: If you’re going Vernazza-style, then I’d go with a Ligurian white wine. 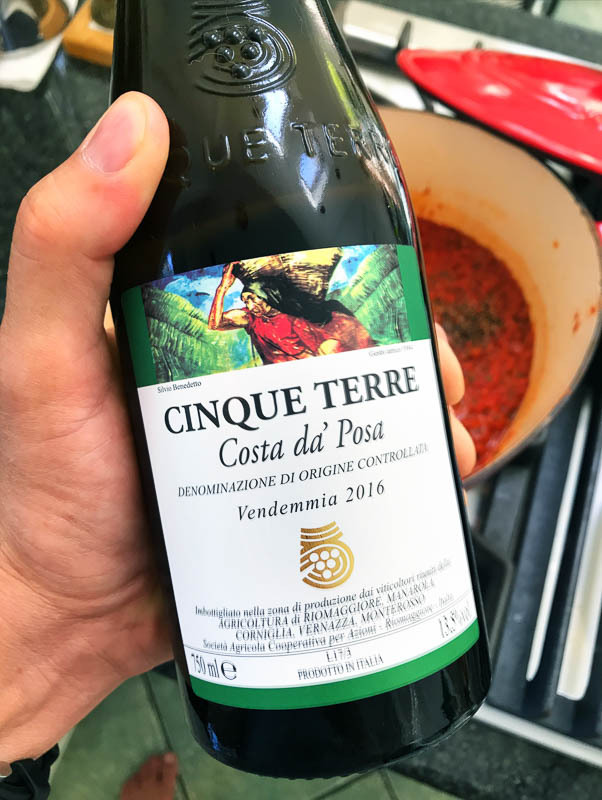 My favorite is either the Cantina Cinque Terre Costa da’ Posa, or the Lunae Vermentino Black Label Lacking these, go with a lighter, unoaked white wine like Sauvignon Blanc or a simple Pinot Grigio. Chop or grind the roasted and skinned peppers into a fine dice or grind. You will want to use roasted peppers and not raw peppers, there’s a big difference in flavor and texture. Set the ground peppers aside. Chop or grind the tomatoes. 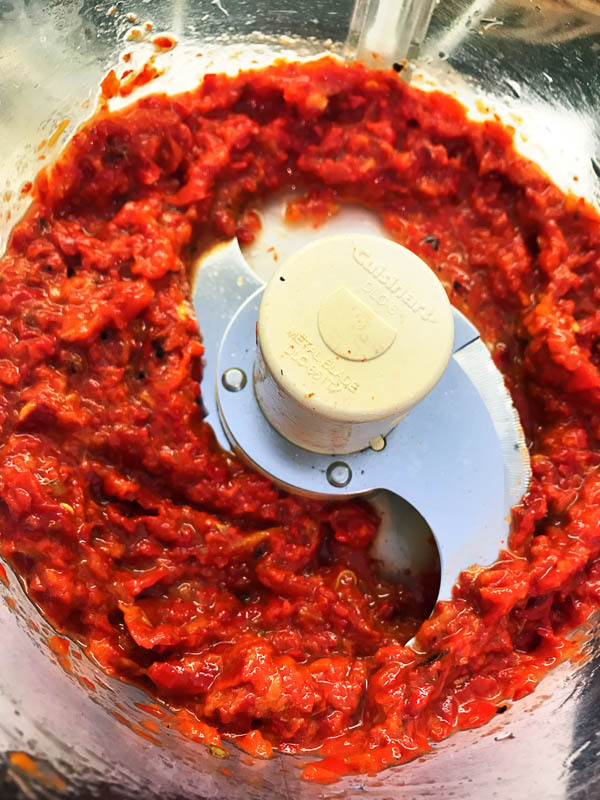 Using a can or box of San Marzano tomatoes is fine, though fresh in the peak season will always be better. If it’s off-season for tomatoes, use canned or boxed tomatoes. Set the ground tomatoes aside. Chop the capers finely and set aside. 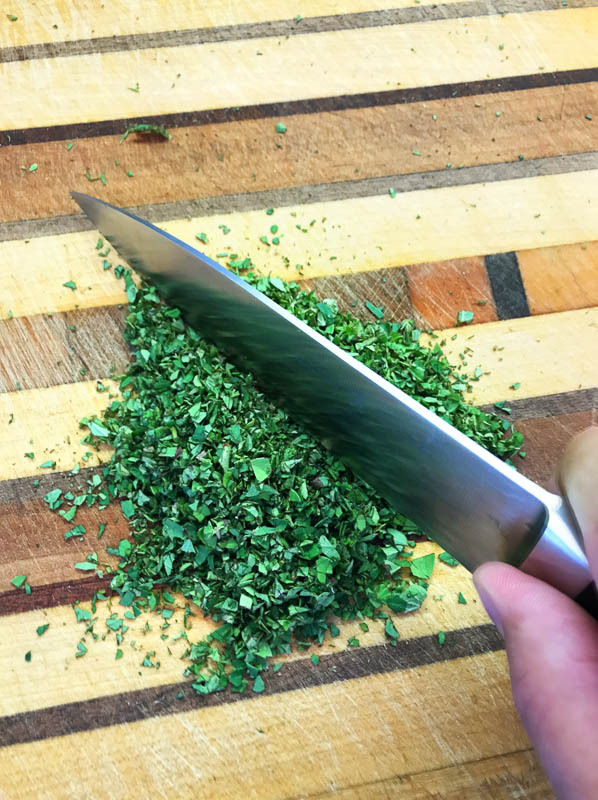 Chop the fresh oregano finely and set aside. If you cannot get fresh oregano, use dried. 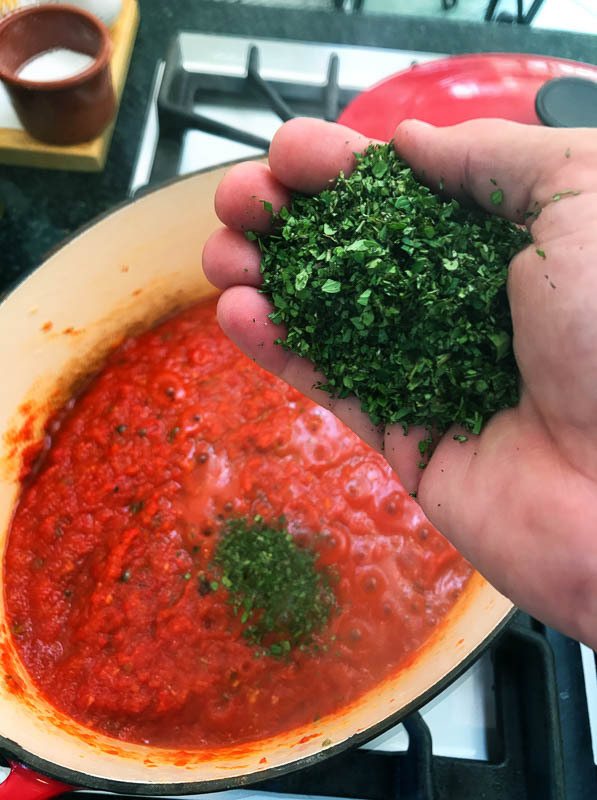 More oregano only makes the recipe more authentic — you want the rich green oregano taste in the Scarpara sauce. Put the olive oil in a wide bottom skillet and turn the heat on to medium. When hot, put in the onion and garlic mixture and cook until the onion is translucent. Add the ground peppers and capers to the onion+garlic mix, stir to mix, then saute them until soft, about 3 minutes. Add the ground tomatoes to the pan and stir. Cook the sauce until it starts to gently percolate (not a boil), stirring from time to time — about 5 minutes. Add the chopped oregano and stir into the sauce. Add some grindings of black pepper and a tablespoon of salt. Reduce the temperature to low heat and cover the pan with a lid. Let the sauce slowly cook for about 1 hour. NOTE: check on the sauce every 15 minutes or so, and if it gets a little dry, add one-half to 1 cup of water to the sauce. Don’t let the sauce dry out. At the end of the hour, taste the sauce and adjust for salt or pepper. In the last 15 minutes of cooking the sauce, bring a pot of water to boil for the pasta, and add 2 tablespoons of salt to the water. Once the water is boiling, add the spaghetti. Cook until the pasta is al dente, or firm to the teeth, about 8-12 minutes (consult the instructions on the pasta package). Don’t overcook. Drain the pasta from the water and place into a bowl. Add the Scarpara sauce to the bowl and toss until the sauce coats all of the pasta. Pour the pasta & sauce into a wide bottomed serving dish, and serve immediately. Provide grated Parmigiano Reggiano on the side. 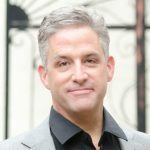 A few notes on the recipe. You can continue to cook the sauce for another 1 to 2 hours if you wish, just add water from time to time so it does not dry out. The sauce will turn a deep, rich red color. The sauce can be prepared in advance, just warm it up in a pan 30 minutes before you want to serve the pasta. Remember to start boiling your pasta about 15 minutes before you want to serve the dish.